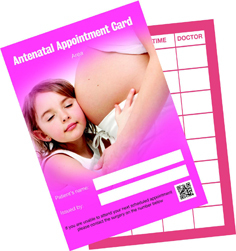 A useful appointment card for mothers to be to record their midwife and doctors appointments. The cards are the same size as a credit card and therefore fit easily into a purse or wallet, which helps remind the patient of the appointment, during this emotional and sometimes stressful time. © 2014 Impact on Life / Healthcare Media. All rights reserved. Privacy. Sitemap.